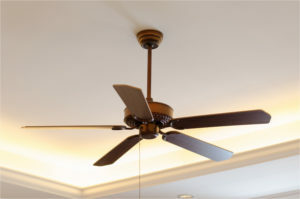 Ceiling fans are a great solution for increased air circulation during warm or cold weather seasons. With a range of sizes and styles, and options for manual, remote control, or voice activated operation, ceiling fans have come a long way. But installing fans can be a nuisance, even for experienced DIYers. It can be even more of a challenge when dealing with the old wiring that is common to many homes in the DC area. We can do most installs in less than 90 minutes, when proper wiring and support are in place.